has been very well preserved. Also, it offers many conveniences. NO SMOKERS NO PETS. The house itself, without being luxurious, is fully equipped and counts 7 enlightened rooms of which 3 bedrooms and a large solarium. The main bedroom counts a queen bed, the secound 3 single beds of which one bunkbed and the thirth one 4 single beds of which 2 bunkbeds. 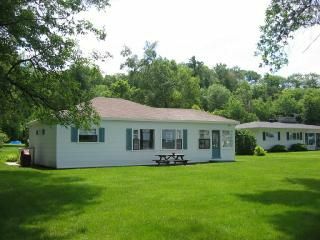 There is also: B.B.Q., patio furnitures, microwave, washer and dryer, TV (cable), radio and DVD, internet access. This house met all of our expectations. We loved waking up and looking out the large living room windows on the Saint Lawrence River. The rooms were all very comfortable and nicely decorated. The kitchen and bathroom had all the conveniences and were equipped to meet our needs for the week. The wide lawn surrounding the house was perfect for our kids to run around in, and we took advantage of the small sandy strip along the water's edge to burn a small campfire and watch the boats go by. Of course, the easy access to Quebec City was of great benefit. We were about 10-30 minutes from most of the major destinations in the area. Quebec City and the Chutes-de-la-Chaudiere were less than 15 minutes away. 30 minutes would get you out to the Chute Sainte Anne and the basilica of Sainte Anne de Beaupre. For an easy kid-friendly stop, we went to Mega Parc in north part of the city (about 20 minutes). The only trick for us was learning to recognize the turn from the main way onto the private road leading to the house, but the owner gave us good directions and we got the hang of it after a couple days. The owners were wonderful to us and made the whole process very easy. We would recommend this to anyone who wants to take an extended vacation with kids to Quebec City. We were looking for something close to Quebec City, yet someplace informal and relaxing. We found the perfect place at the Summer House. It was very well equipped. It had everything we needed for cooking, a great BBQ, and the cottage had lots of room. We loved being able to enjoy the property outside to play badminton, have campfires, walks on the beach, and watching the ships go by. What a great location! The cottage was so quaint, clean and comfortable and the owners were very nice to us. Thanks Lucille and Gaston for a wonderful vacation. groceries, drugstores, medical clinics, public library etc. watch them or feed them. NAUTICAL EQUIPMENT IS NOT AVAILABLE ON SITE. Heather, Garry, Sherlene and Larry: Great location. Cute house. est parfait. Nous espérons pouvoir revenir encore l'an prochain. Liz and family: It was a wonderful mounth in the cottage. 2019/05/01 to 2019/06/01: 1 200,00$USD/CAD per week, 2000,00$USD/CAD per month. 2019/06/01 to 2019/09/30: 1 800,00$USD per week, 3 000,00$USD per month. 3days:295,00$USD per day, 4days:275,00$US per day, 5 days: 265,00$USD per day, 6 days: 255,00$USD per day. 2018/10/1 to 2018/10/31: 195,00$USD per week, 2,000,00$USD per month. Full weeks only. Full summer season from 2019/06/01 to 2019/08/31: 9 500,00$USD/CAD. Full summer season from 2019/05/01 to 2019/10/31: 13 000,00$USD/CAD. PRICES ARE FIXED FOR 2-6 PERSONS.15,00$USD/CAD ADDITIONNEL PER PERSON PER DAY FOR MORE. A DEPOSIT OF 400,00$USD/CDN THAT WILL BE REFUND AFTER THE INSPECTION Note: Until confirmed, rates are subject to change without notice.